Well worth a try, these beautiful red flowers will attract butterflies, hummingbirds and bees and will thrive in containers in warm, sheltered, sunny locations. 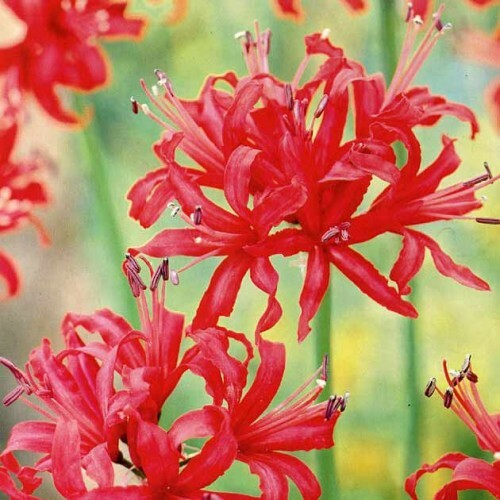 Commonly known as the Guernsey Lily, Nerine 'Kodora' is a very popular cut flower. Expect the long lasting red clusters to appear at the end of the growing period (Sept - Oct) when the foliage has almost withered. Nerine 'Kodora' can be grown in gardens in zones 8-10 and in any zone if put in a container and moved indoors over the winter. Containers should be brought indoors to a cool, brightly lighted location in winter. One advantage of growing these bulbs in containers is that they like to be crowded and will blossom more freely when crowded together in a pot or container. Be sure to repot every four to five years.